1. Any poorly dieted human who lives in a particular region of a town most likely having been born and raised there. Regionrats rarely leave their hometowns to live elsewhere. After a failed six month attempt to live in Seattle, Ray (Connor Williams) returns to his hometown and the region he grew up in to finish his senior year of high school. Mid-1990’s life hasn’t changed in his small Indiana town including the reasons why he left. Thrown back into a mix of high school bullies, manipulative girls and fake friends, Ray returns to his old ways of staying high, poor dieting and wasting his teenage life. Ray will have to go through hell if he wants to get out of the region again or forever remain a Regionrat. A coming-of-age tale that’s an excerpt of Ray’s life as adapted from the novel from Richard Laskowski. Director Javier Reyna’s interpretation glimpses similarly themed movies like Almost Famous and Empire Records on a budgeted narrative. 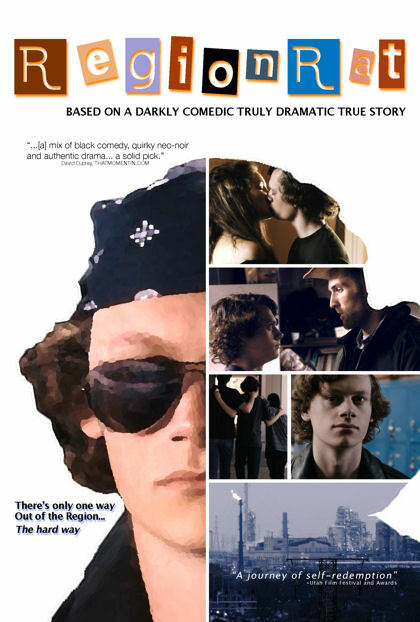 Coming-of-age movies are a weakness of mine and Laskowski’s story strikes a time I grew up in. The simple storytelling is real without the over the top Hollywood theatrics and is a better movie for it. A cast of youths does wonders drawing you into their characters. Harry Holmes in particular stands out in a smaller role and an excellent scene; however this one is carried by the performance of Connor Williams. Williams plays a likable loser with hands of steel well. You’ll enjoy his successes yet not fret over his failures. Reyna’s first feature makes the viewer suspend disbelief transporting them twenty years ago in the middle of high school drama and real life teenage angst. A simple success so many films fail at. There isn’t much horror here but coming of age fans like me shouldn’t miss it. I may have been the target audience of this indie regional but a good film is still a good film.